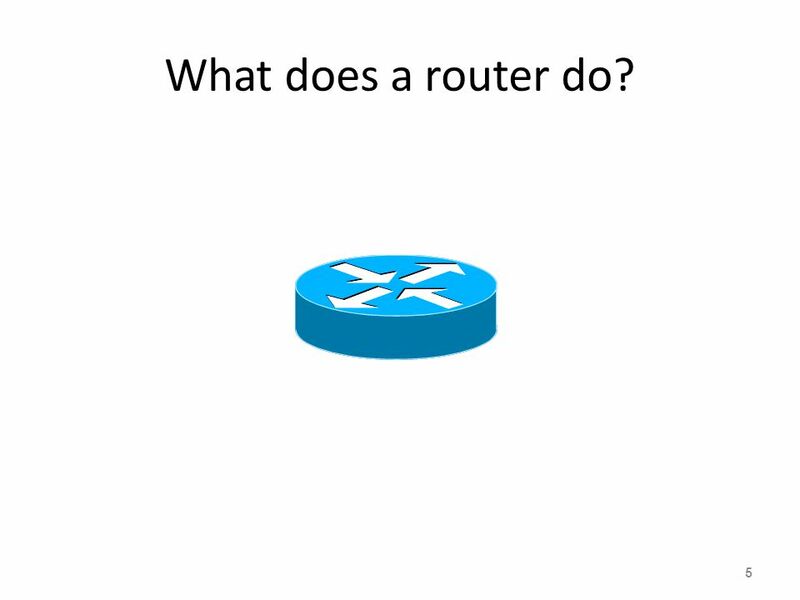 5 What does a router do? 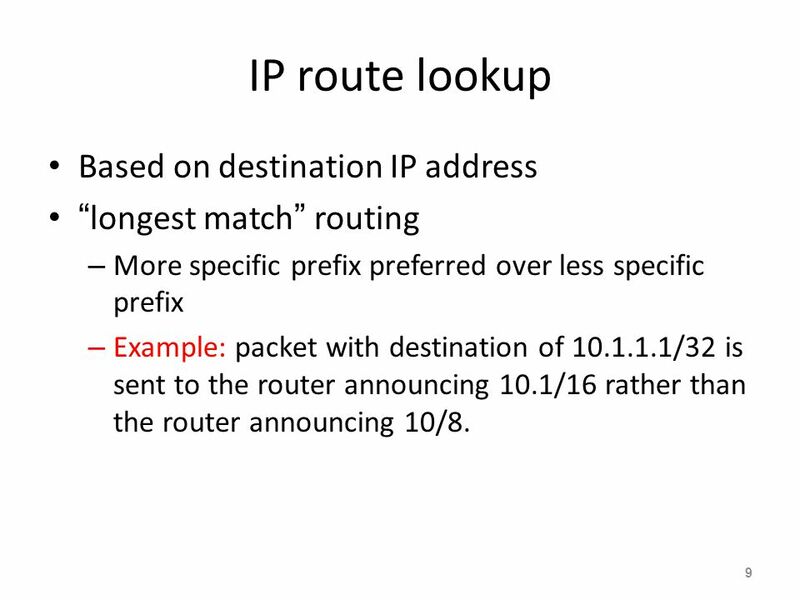 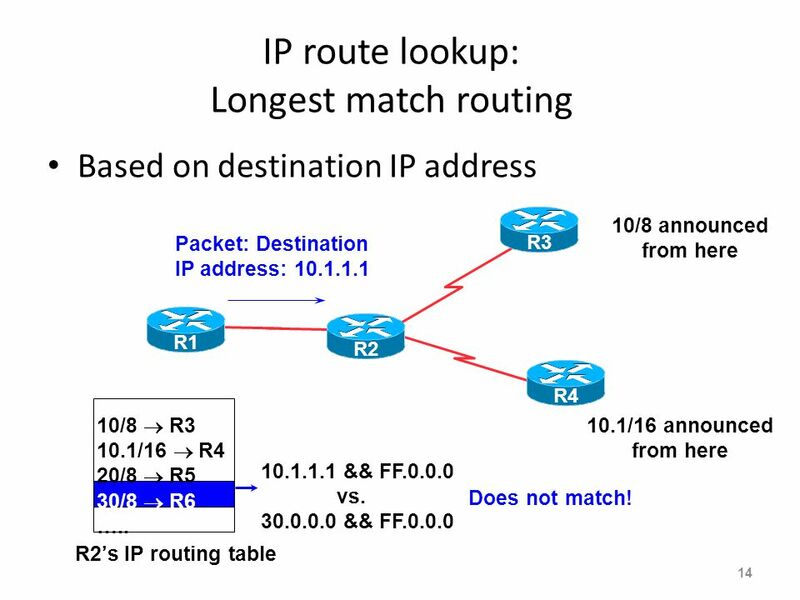 “longest match” routing More specific prefix preferred over less specific prefix Example: packet with destination of /32 is sent to the router announcing 10.1/16 rather than the router announcing 10/8. 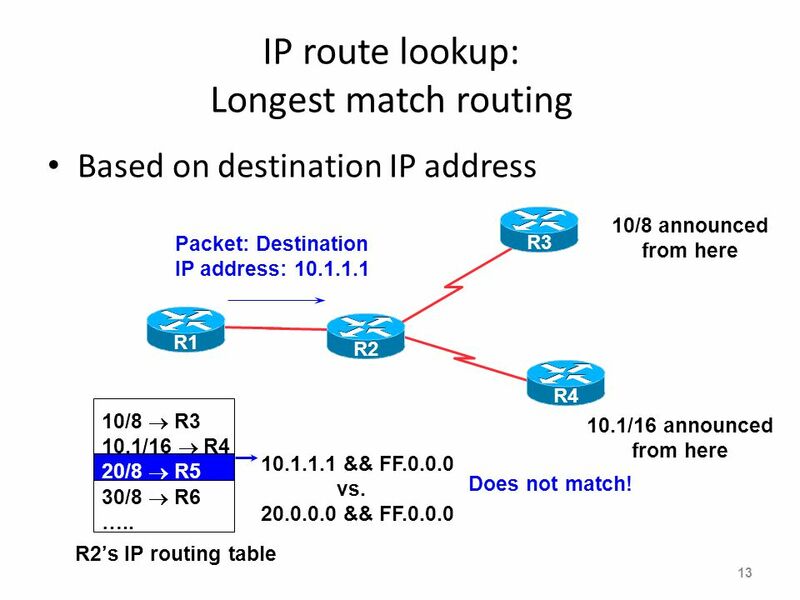 Based on destination IP address R3 10/8 announced from here Packet: Destination IP address: R1 R2 R4 10/8  R3 10.1/16  R4 20/8  R5 30/8  R6 ….. R2’s IP routing table 10.1/16 announced from here && FF.FF.0.0 vs. && FF.FF.0.0 Match as well! 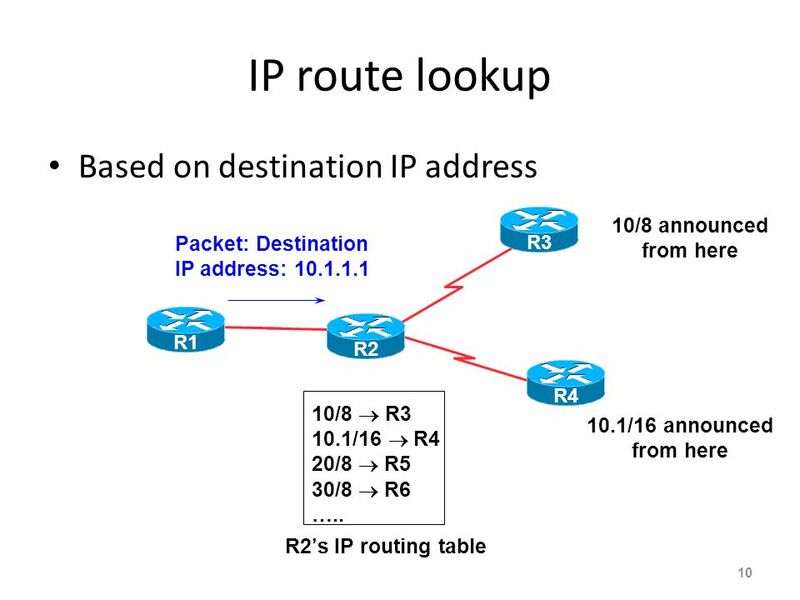 Based on destination IP address R3 10/8 announced from here Packet: Destination IP address: R1 R2 R4 10/8  R3 10.1/16  R4 20/8  R5 30/8  R6 ….. R2’s IP routing table 10.1/16 announced from here && FF.0.0.0 vs. && FF.0.0.0 Does not match! 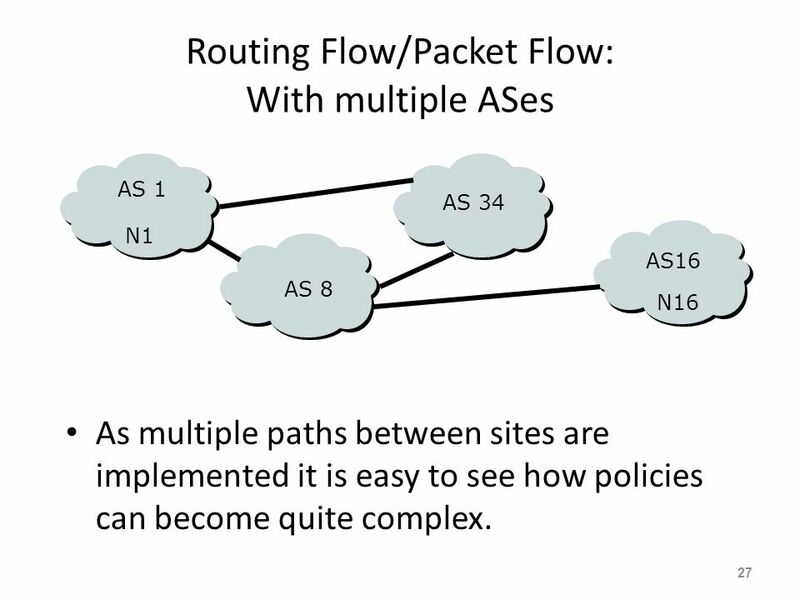 As multiple paths between sites are implemented it is easy to see how policies can become quite complex. 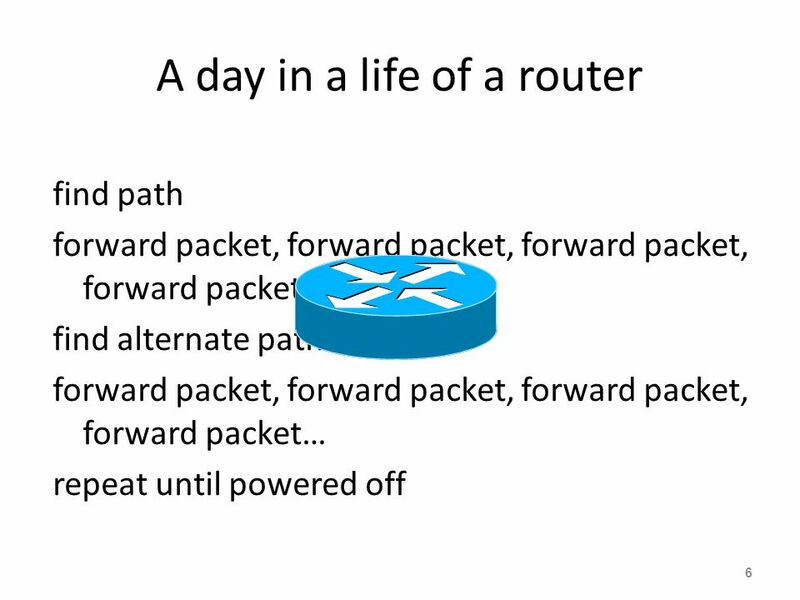 …but what do the routers get up to? 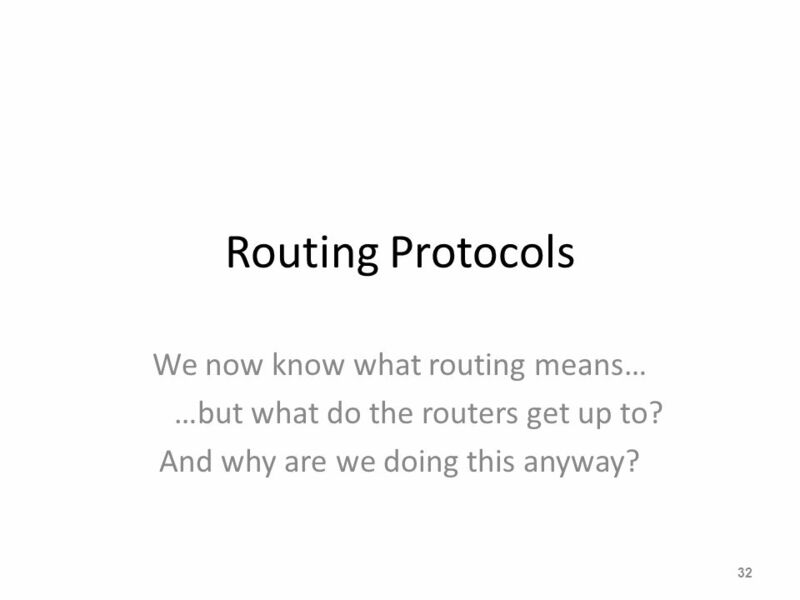 And why are we doing this anyway? 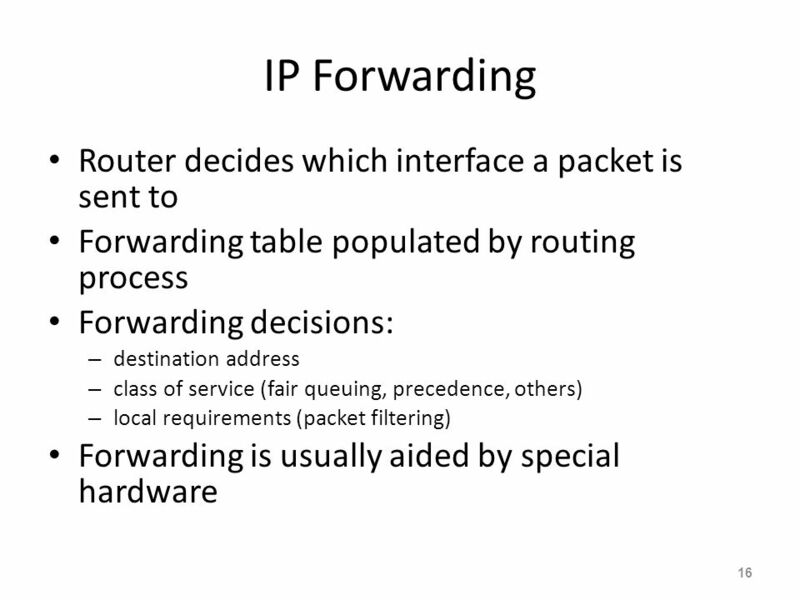 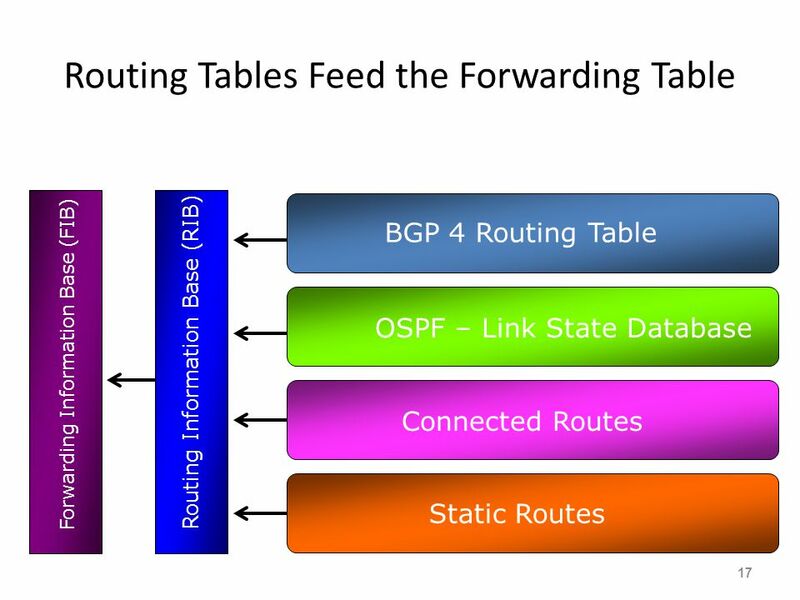 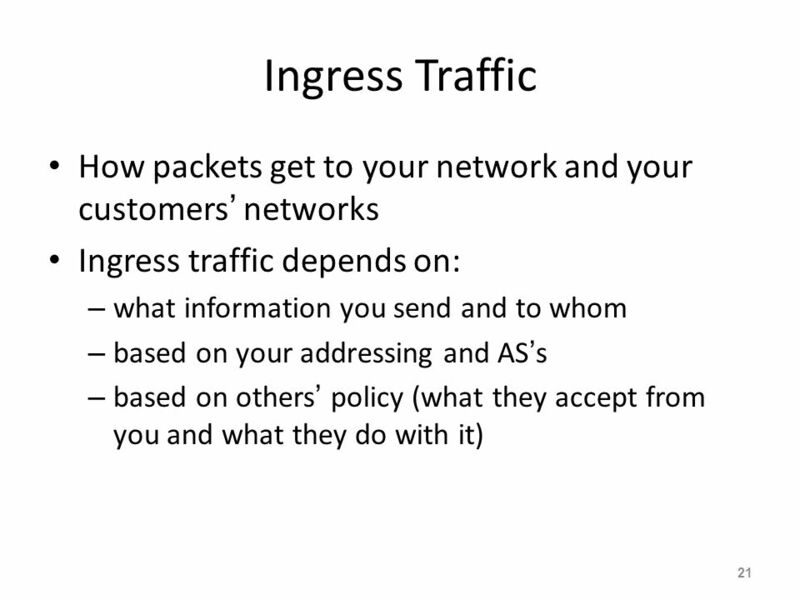 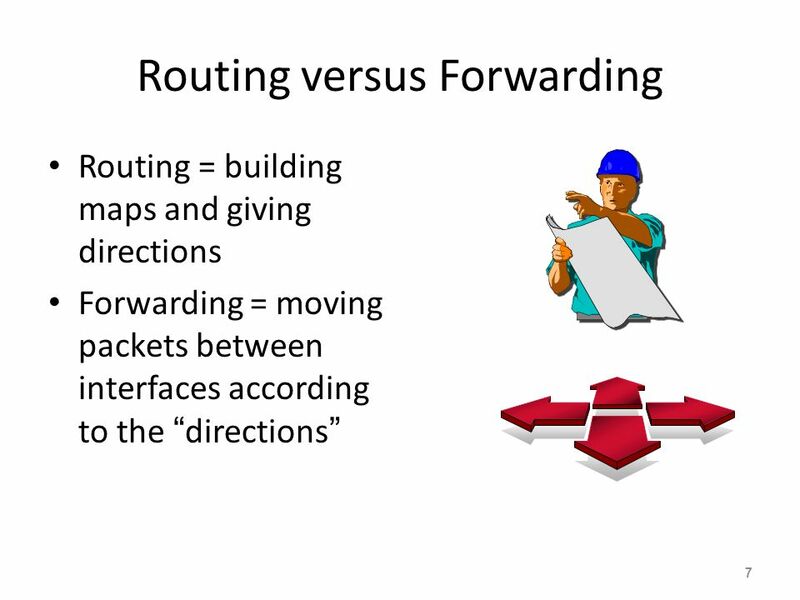 Chapter 22 Network Layer: Delivery, Forwarding, and Routing. 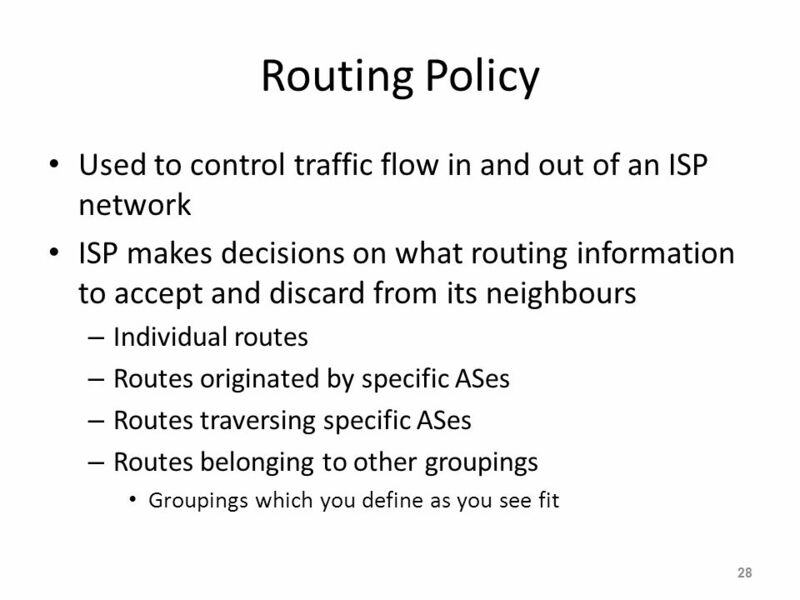 Dynamic Routing Scalable Infrastructure Workshop, AfNOG2008. 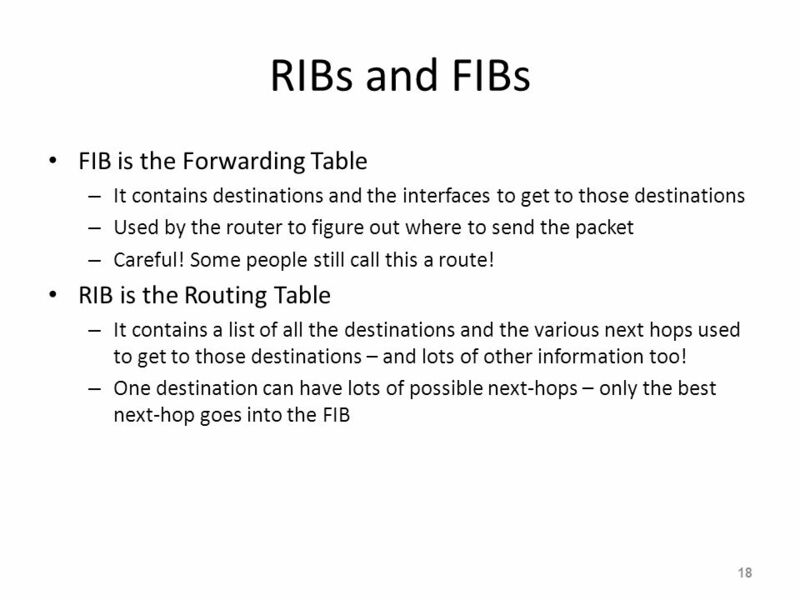 Routing Basics By Craig Lindstrom. 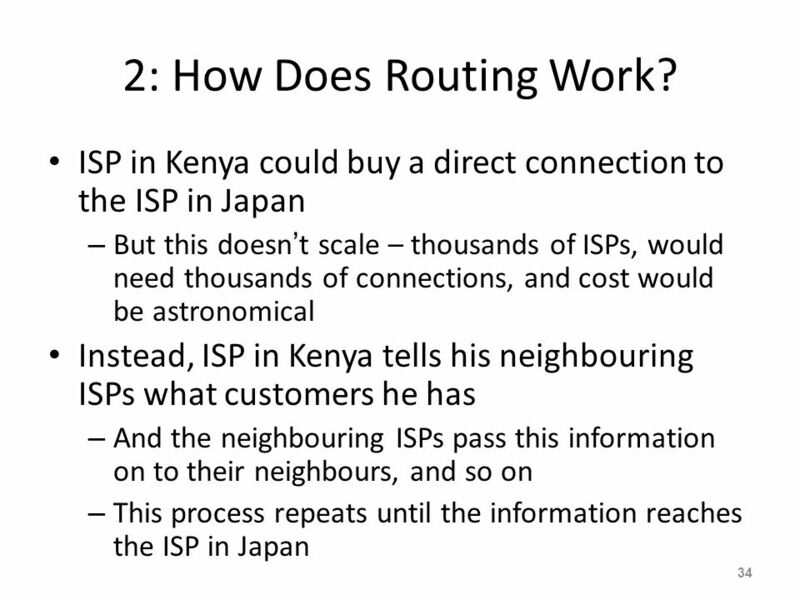 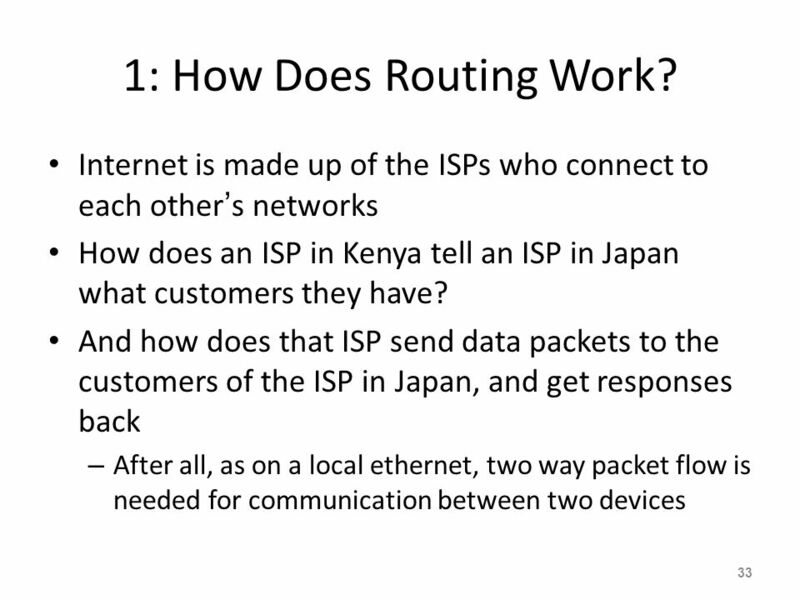 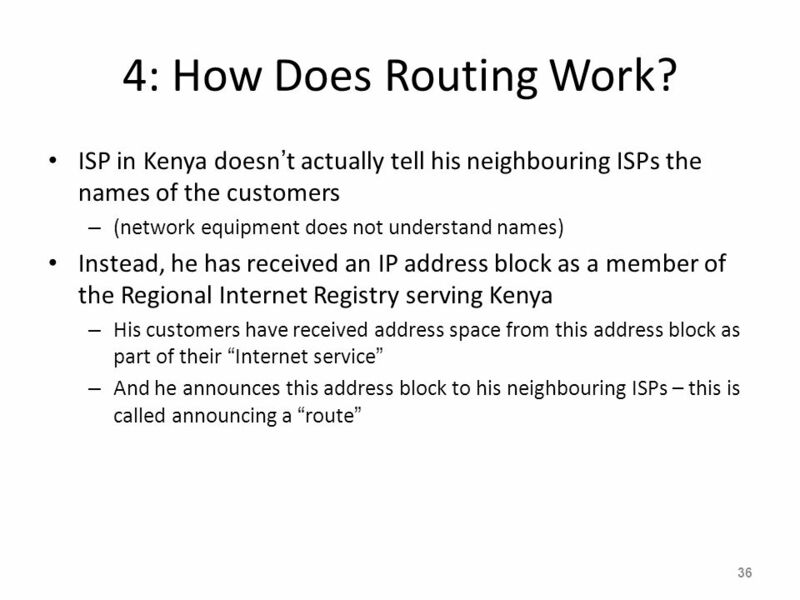 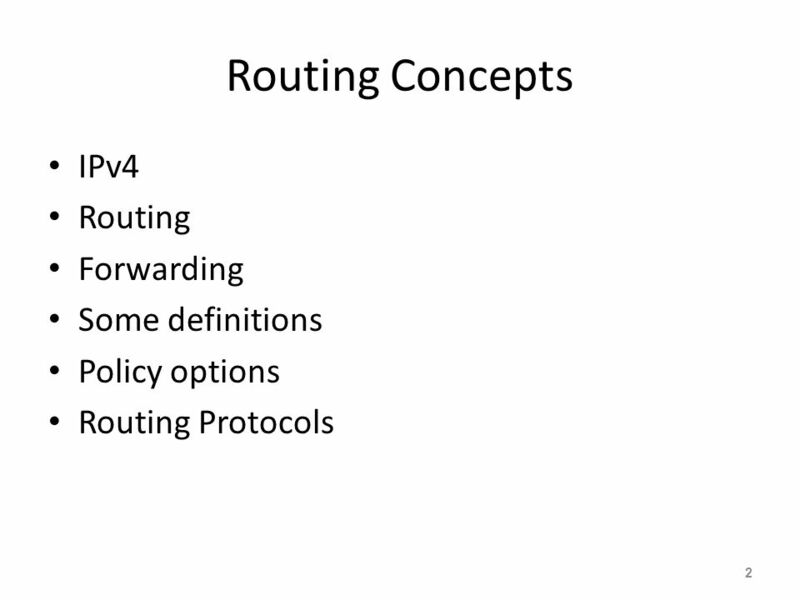 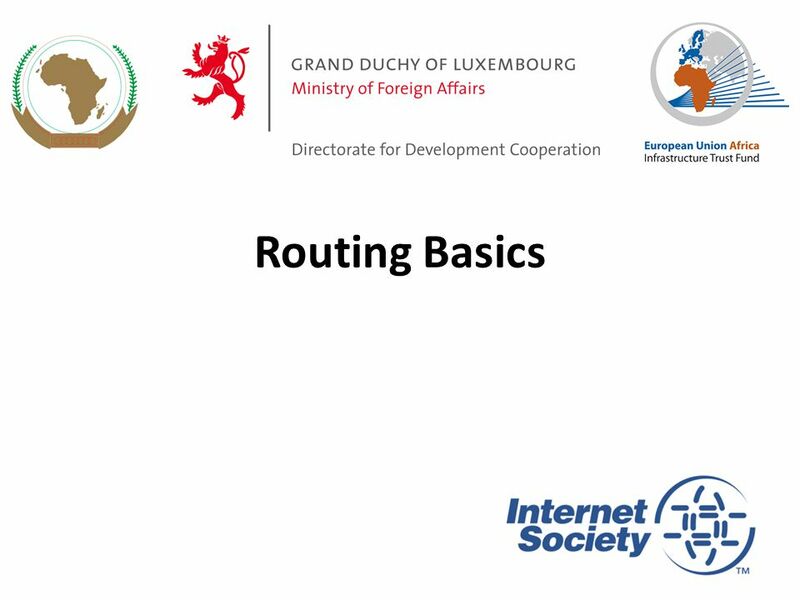 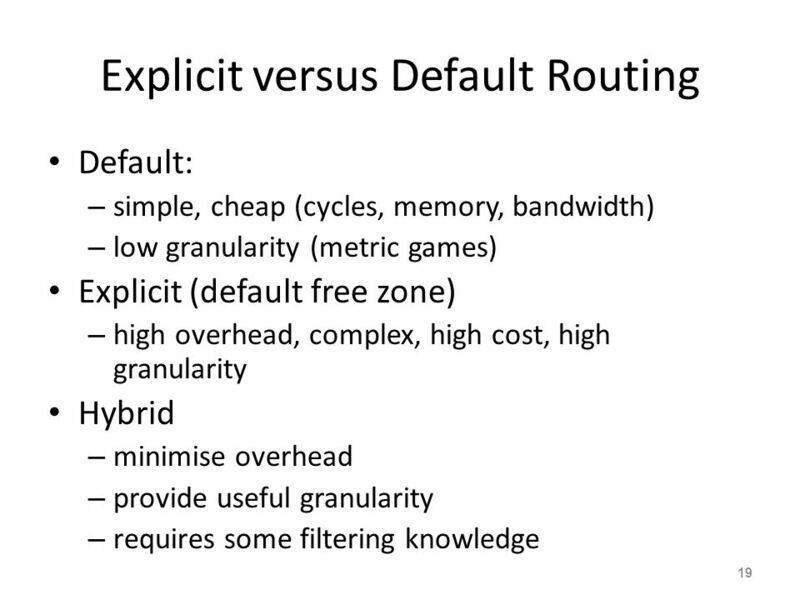 Overview Routing Process Routing Process Default Routing Default Routing Static Routing Static Routing Dynamic Routing. 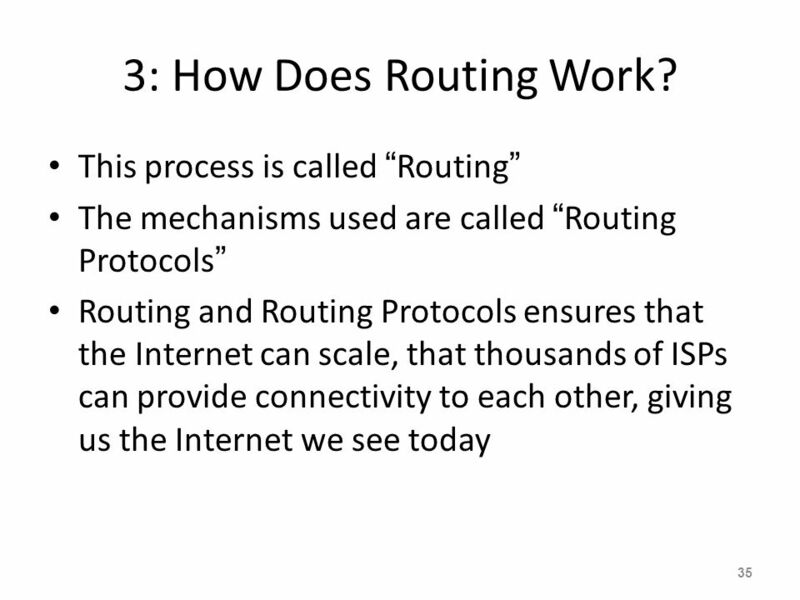 Copyright 2002 Year 2 - Chapter 5/Cisco 3 - Module 5 Routing Protocols: IGRP By Carl Marandola. 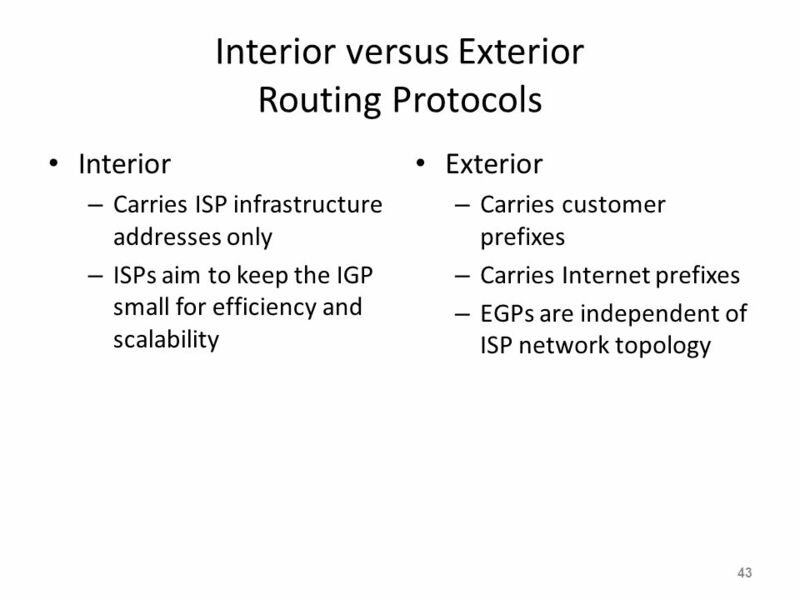 CISCO NETWORKING ACADEMY Chabot College ELEC Routed and Routing Protocols. 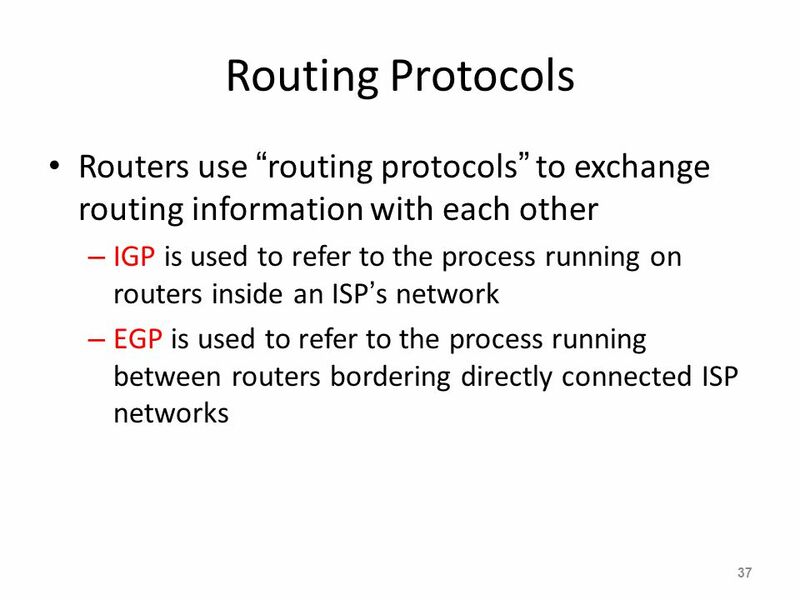 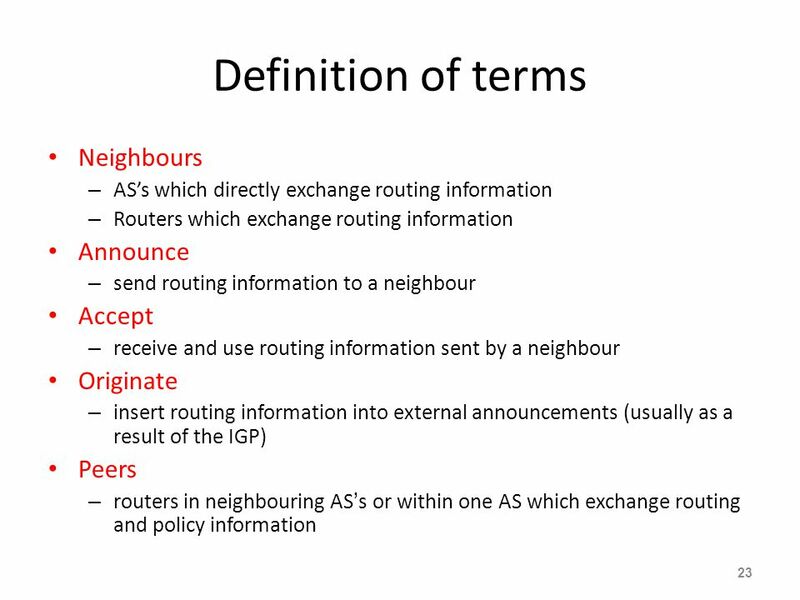 1 Interdomain Routing Protocols. 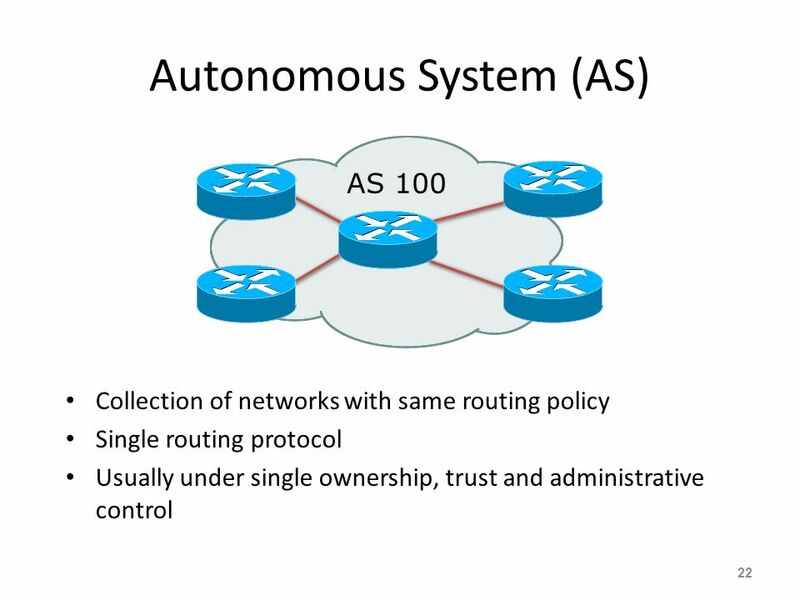 2 Autonomous Systems An autonomous system (AS) is a region of the Internet that is administered by a single entity and. 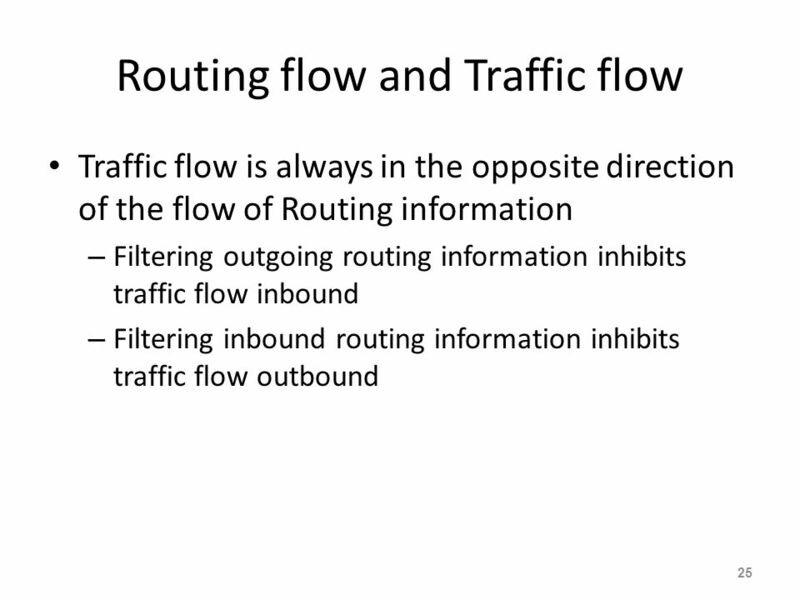 © 2007 Cisco Systems, Inc. All rights reserved.Cisco Public 1 Version 4.0 Introduction to Dynamic Routing Protocol Routing Protocols and Concepts – Chapter. 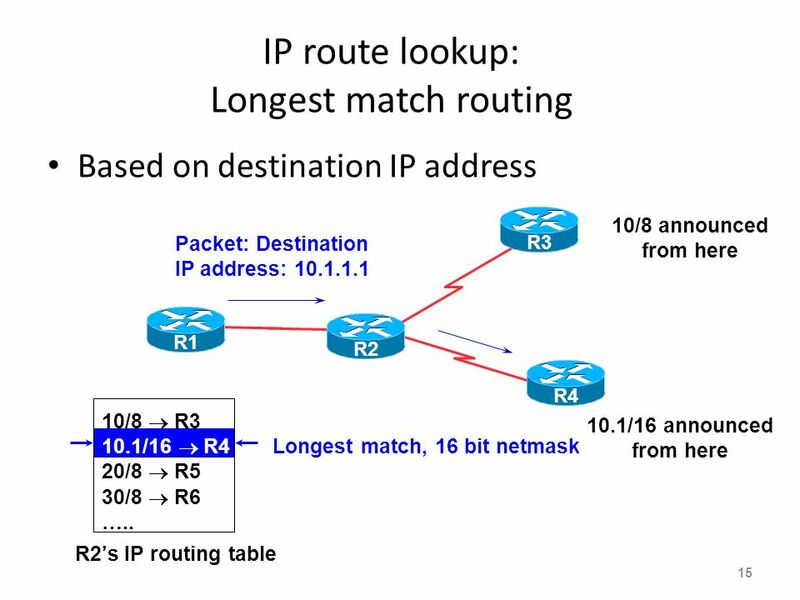 © 2007 Cisco Systems, Inc. All rights reserved.Cisco Public 1 Version 4.1 Routing Working at a Small-to-Medium Business or ISP – Chapter 6. 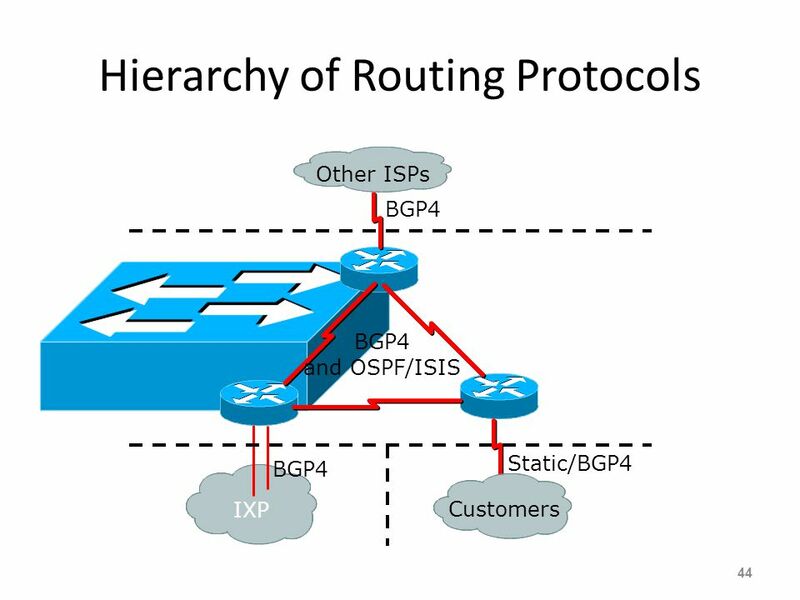 © 2009 Cisco Systems, Inc. All rights reserved. 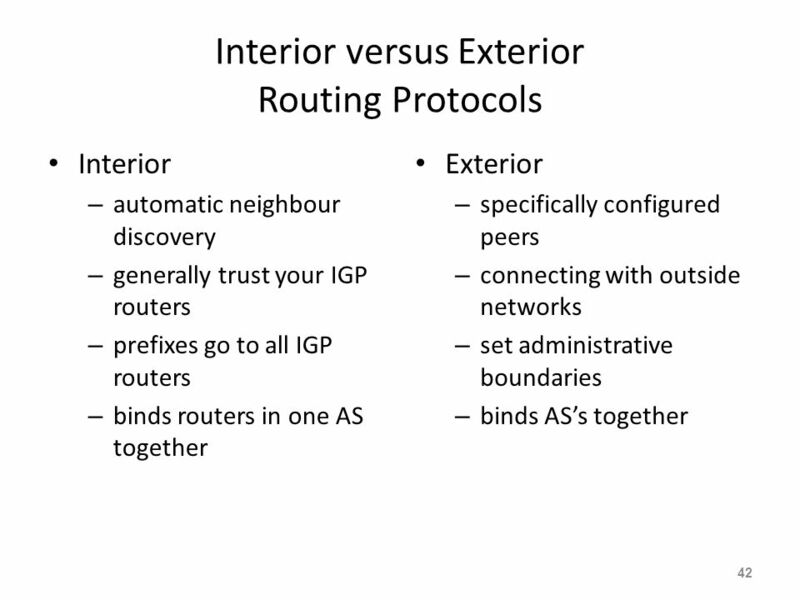 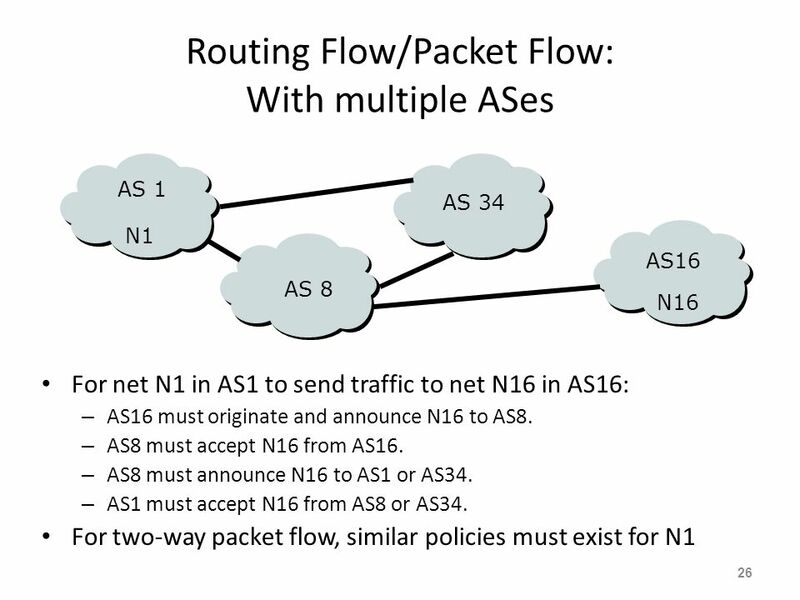 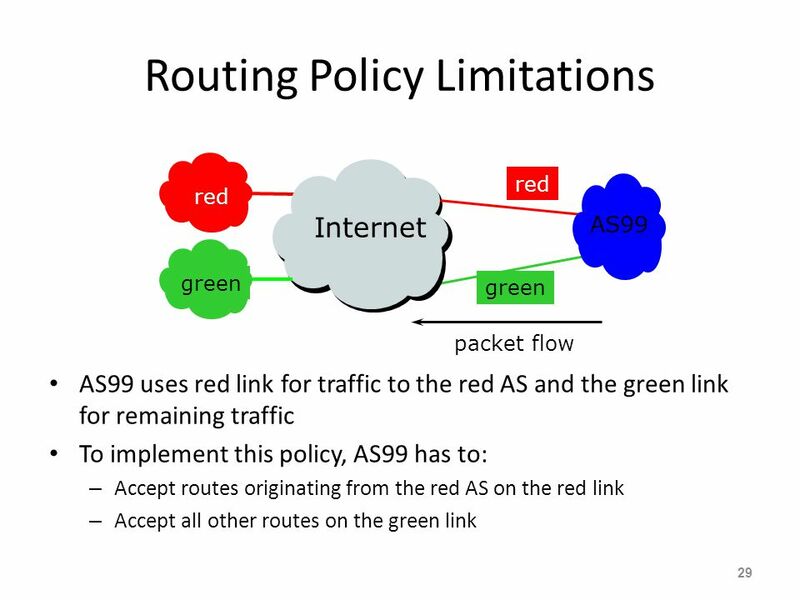 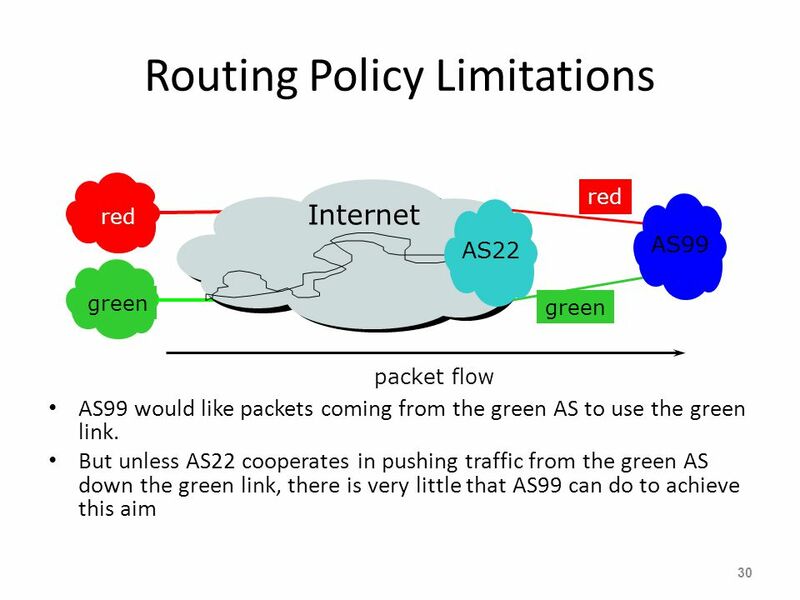 ROUTE v1.0—6-1 Connecting an Enterprise Network to an ISP Network Considering the Advantages of Using BGP. 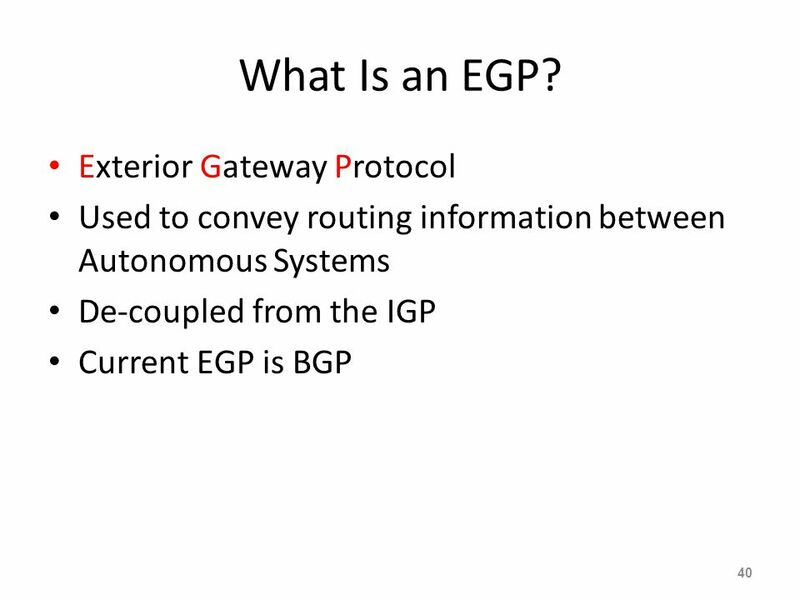 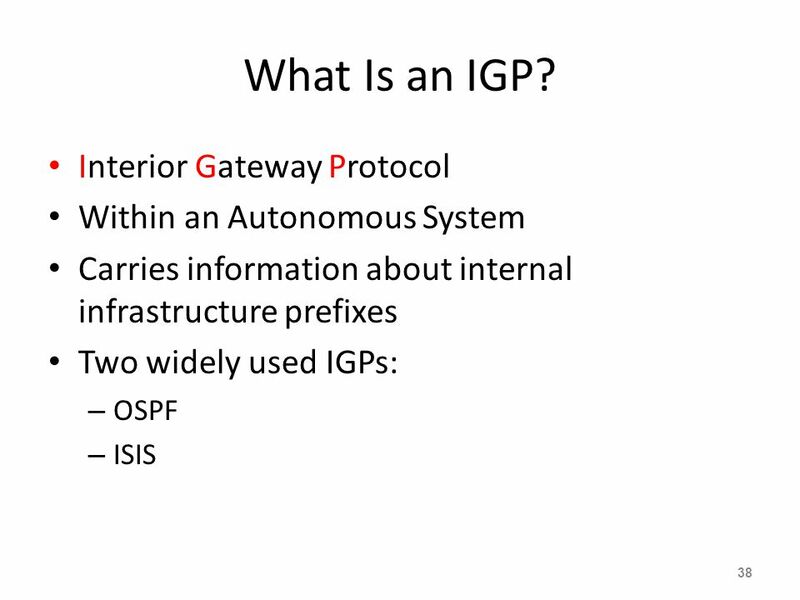 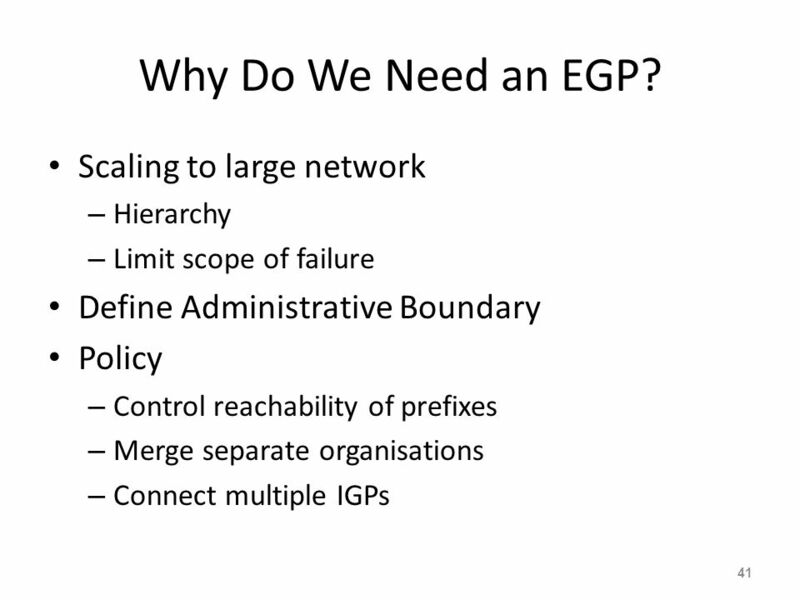 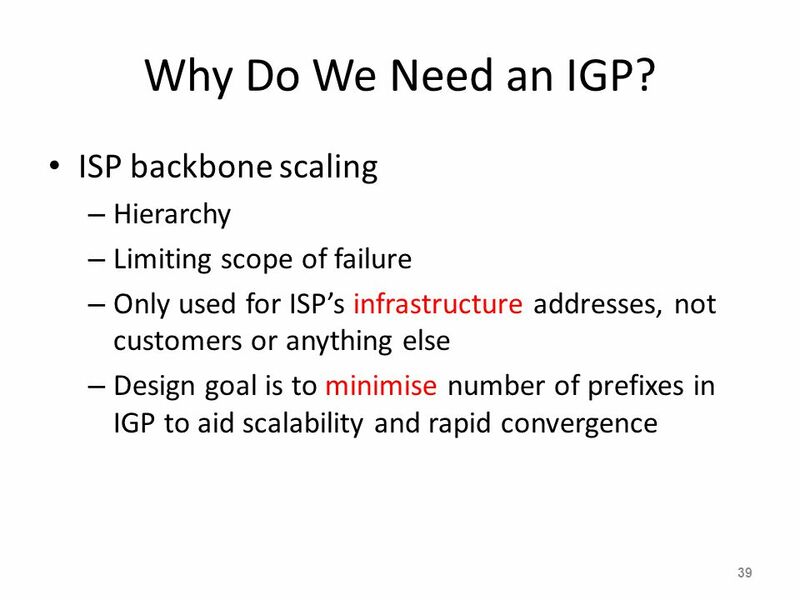 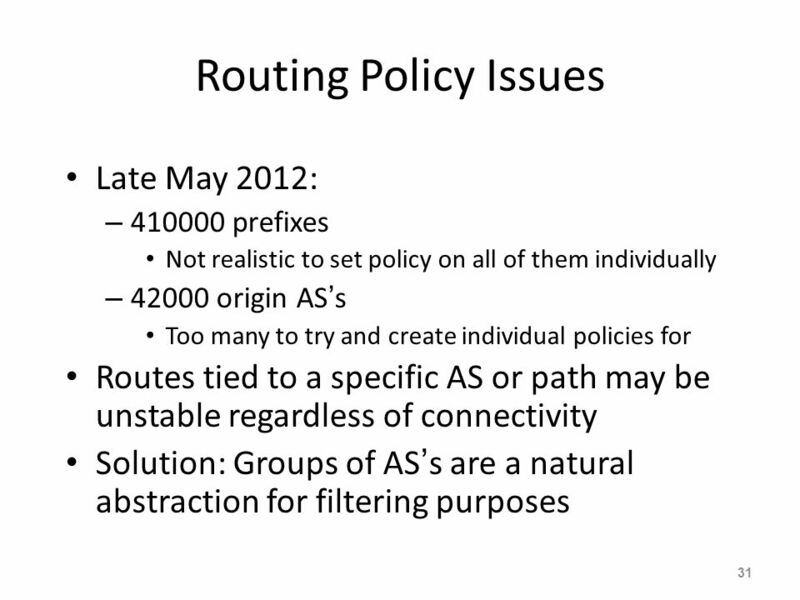 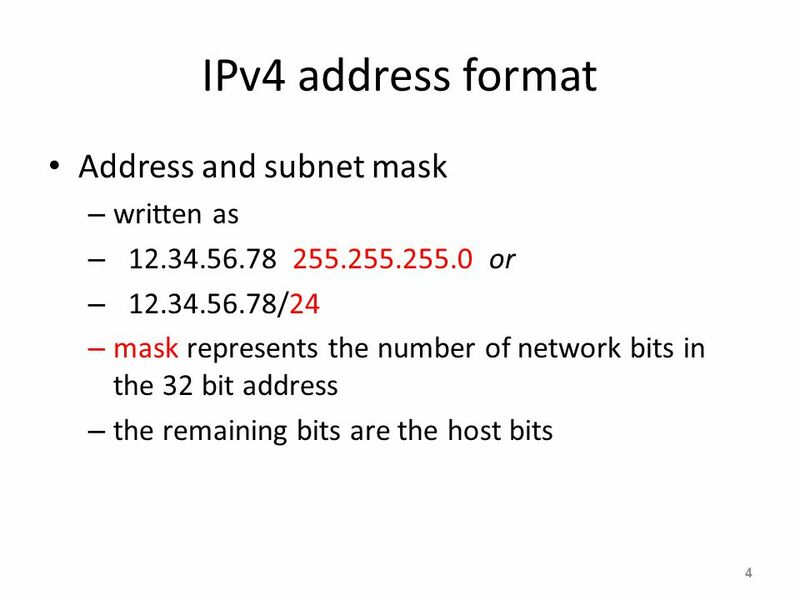 Border Gateway Protocol (BGP4) Rizwan Rehman, CCS, DU. 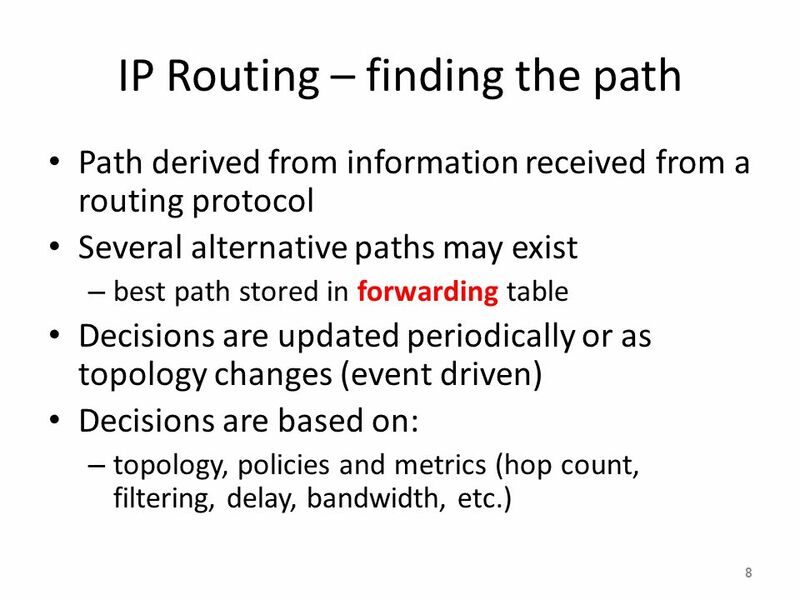 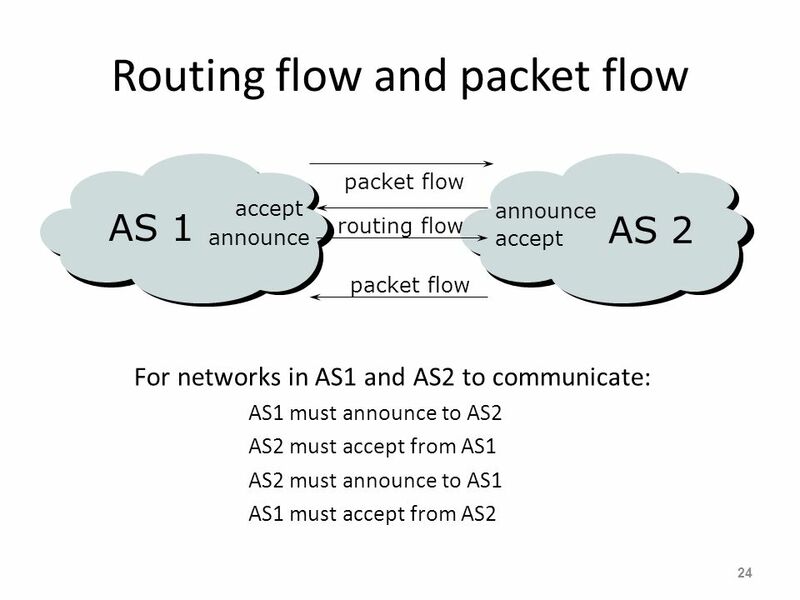 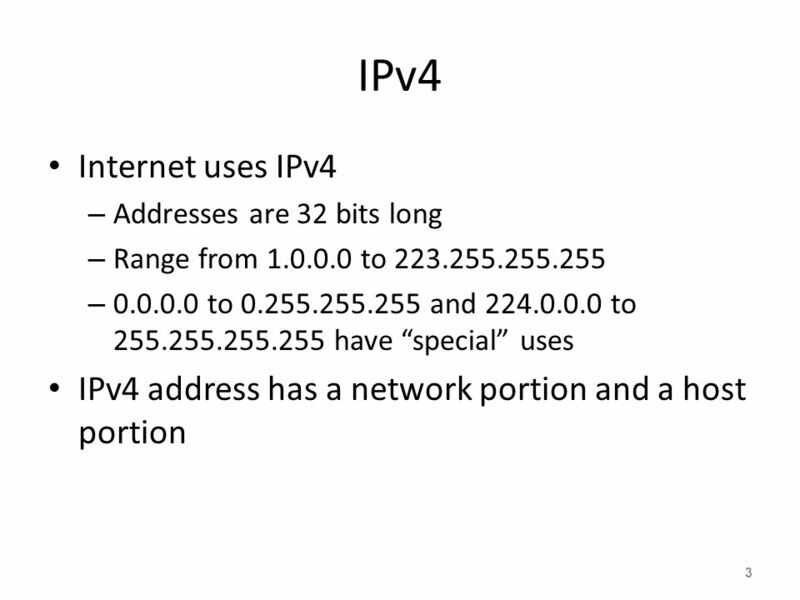 Fundamentals of Networking Discovery 2, Chapter 6 Routing. 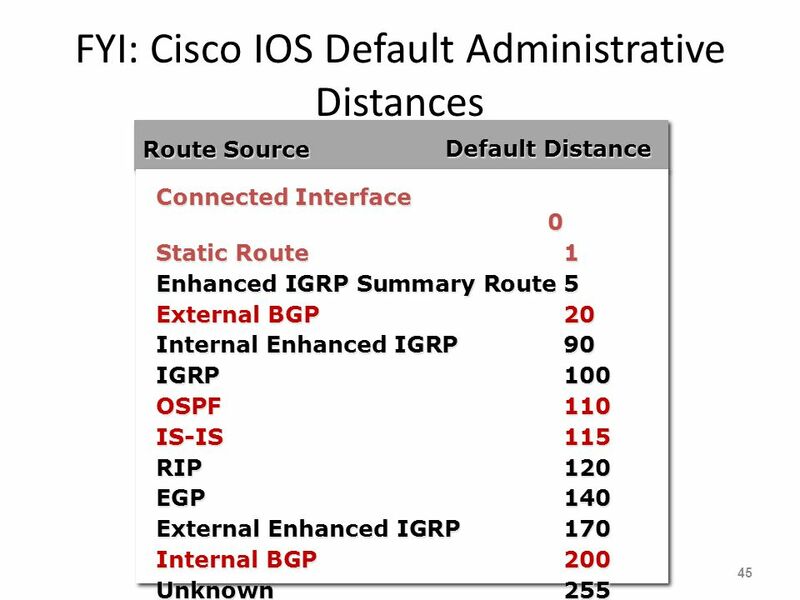 CCNA 1 Module 10 Routing Fundamentals and Subnets.